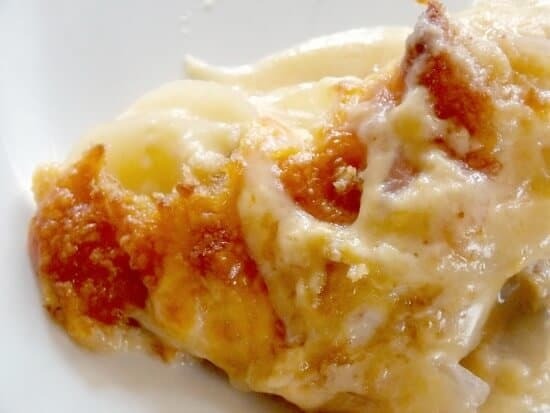 This easy creamy potatoes au gratin recipe will quickly become a family favorite. Gooey cheese, tender potatoes, and a crunchy, crumbly Panko topping makes these potatoes au gratin the best you’ve ever tasted! I love scalloped potatoes and potatoes au gratin. Who am I kidding? I love potatoes done any way you care to cook them. I would sneak the leftover boiled potatoes out of the fridge when I was little and furtively take them to my playroom to snack on. Potatoes are full of potassium, cheap, and a great filler when your kids hit that eat-everything-in-site phase. I don’t eat them often now because my body likes to store carbs in a big way. A big, BIG way. This dish may be a little different than how you usually make it. I layer the sliced potatoes, making three layers of potatoes with layers of onion and cheese in between. Meanwhile you make a cream sauce on the stove, add sharp cheddar cheese and stir until smooth. That sauce goes over the potatoes and then the whole thing is covered with aluminum foil. This allows the potatoes to bake and steam, ensuring that they aren’t raw when you serve them. Just before you take them out of the oven you uncover them and sprinkle on more shredded cheese and Panko bread crumbs. It’s amazing I tell ya. Now, be sure to use sharp or extra sharp cheddar in these creamy potatoes au gratin . Sometimes I like to use part smoked cheddar as well and that is really good. You want the cheddar to be sharp and highly flavored so that it doesn’t get lost in the cream sauce. [pullquote]When making a cream sauce always cook the flour for at least a minute or two to get the raw, starchy taste out. [/pullquote]That’s important. It’s also imperative that you taste the cream sauce – cheese mixture before you add it to the potatoes. If it seems bland add salt a little at a time and stirring it well. Taste after every addition so you don’t over salt it. Put a baking sheet under your casserole because these will spill over a little — they’re ‘sposed to. It’s part of the charm. Those crusty, blackened bits add flavor or something. I don’t know but they are just bland if it doesn’t spill over. Trust me. Serve these the next time you have ham or roast chicken. I promise your family will worship you. Well, maybe worship is a bit too extreme. Let’s just say they will like them… a lot. I love potatoes au gratin, Marye and you’re right, it just has to spill over in the oven. That’s how you know it’s prepared right. This looks delish! 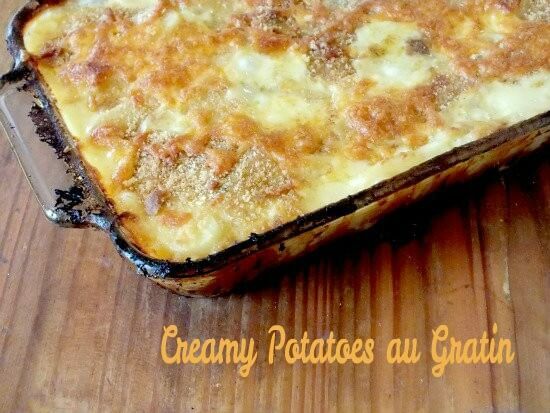 Love potatoes, and these creamy potatoes au gratin look so delicious! They are. This is one of my all time favorites! I love potatoes, too. They are especially good with all of that wonderful sharp Cheddar cheese! Man, I shouldn’t read these posts right before dinner; I am going to have to go make some potatoes! Potatoes and cheese has to be one of the best flavor combinations ever! Perfect autumn side dish! Yep and it’s easy to make into a main dish casserole by adding some ham or ground beef… I love dishes like that. I love potatoes just like this Marye. Sharp cheddar is the best, and I know Cabot extra sharp would be perfect for this yummy recipe. I love au gratin potatoes, too. It is that creamy sauce that makes them so divine. Absolutely! I need to make these more than I do. I love the crunchy topping on this – looks like pure comfort food!! Bring on the cheese! Yum, these sound amazing. Like the panko on top! These look delicious! I love potatoes, too…especially with all that cheese! I tried to make the sauce, it looked fabulous but once cooked, it looked like it curdled. The milk was good, I don’t know what I did wrong.